The raised tee offers a commanding view of the hole which runs parallel to the Hastings to Eastbourne railway line though the conservative player’s eye will be on the large pond carefully situated on the point where the hole dog-legs left. Consideration must be given to whether the hazard can be carried as the risk and rewards need to be assessed. With these hazards behind, the straight drive with a following wind can run on offering an outside chance of reaching the green in two. 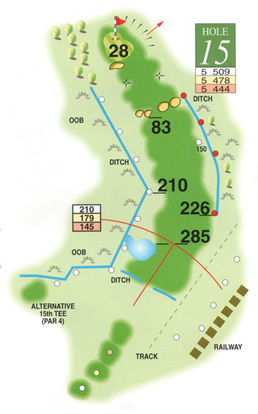 There are fairway cross bunkers some 100 yards short of the raised green which can stifle the aggressive lagged shot but the green itself slopes from right to left and also runs downhill from the back so the ideal shot in should preferably leave an uphill putt. There are severe breaks which need to be considered and pace is again essential here.